The Three Rivers Tibetan Cultural Center preserves, promotes and presents Tibetan culture in its many aspects to the people of Western Pennsylvania. A special emphasis is put on the study and practice of Tibetan Vajrayana Buddhist religion and spirituality through our Three Rivers Dharma Center branch. The Dharma Center offers authentic teachings and meditation practices in the Drikung Kagyu tradition, led by our Spiritual Director, Ven. Khenpo Choephel. We strive to create a warm, supportive environment for the study and practice of the Buddhist dharma, as well as other aspects of Tibetan culture such as the Tibetan language, calligraphy, ritual arts, and medicine. We believe that the ancient wisdom of Tibetan culture has much to offer of relevance to the Western world today, and should not be forgotten. All are welcome to attend our meditation practices, teachings and other events, as well as to study in our library, which includes a complete set of the Kangyur and Tengyur texts, or our many Tibetan thangkas. Please check our Schedule for regular meditation practices and teachings. Donations are welcome to support our mission, and can be done through PayPal by clicking on the DONATE button or by using the donation basket at our center. Ven. Khenpo Choephel is also available for prayer requests for those who are sick, for those who have passed away, or to bless your home. 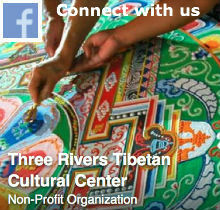 For more information, email us at threeriversdharma@gmail.com.